Per your request, I have put together for you my "4 Easy Steps to Perfectly Washed Makeup Brushes". It's important to keep your makeup brushes clean not only for hygienic purposes, but also because if your brushes are not clean your makeup will not apply as well as it could. 1. In water that is NOT hot and not cold (right in the middle and slightly on the cooler side), holding just two brushes at a time DOWNWARD (never upward! ), wet your brushes. After they are wet, pull them away from the running water and gently shampoo your makeup brushes for a quick moment in a circular motion with the same liquid soap you would use to hand wash dishes with in the sink. (This soap is specifically designed to strip off the toughest of grease, which inevitably cakes up on your makeup brushes from the natural oils on your skin and then additionally, perfectly cleans all of the imbedded makeup off of your bristles. The reason you never want to hold the bristles upward is because most bristles are held together at the base by glue and having the water (especially warm water) direct stream-line the glued area, will more quickly melt the glue and loosen the bristles, leading to unnecessary bristle loss and damaged brushes). 2. Rinse the soapy brushes off under the running water (always holding the bristles pointed downward at all times). Pull brushes away from the running water again and gently massage a conditioner of choice into the freshly washed bristles, one that you'd use for your hair and one with a smell that you like. (You need to do this to soften up the bristles again so they are not dry and coarse feeling on your face later on). 3. After you have rinsed off the conditioner thoroughly from the bristles, (holding the brushes downward at all times), squeeze out all of the excess water from each brush, one brush at a time and then lay each one on a flat surface to dry, with a clean paper towel underneath all of them. The paper towel absorbs the dampness from the wet brushes and also ensures the brushes are drying on a completely hygienic surface. (If you have pets, place the paper towel on a plate or tray and hide it in an area where they cannot tamper with them). 4. Let the brushes dry in open air for at least 12 - 14 hours! (I often wash my own brushes right after I have finished doing my makeup so that they will have ample time to fully dry before their next use, which is typically the next day). For Professional makeup brush use: Repeat brush washing instructions after each client. 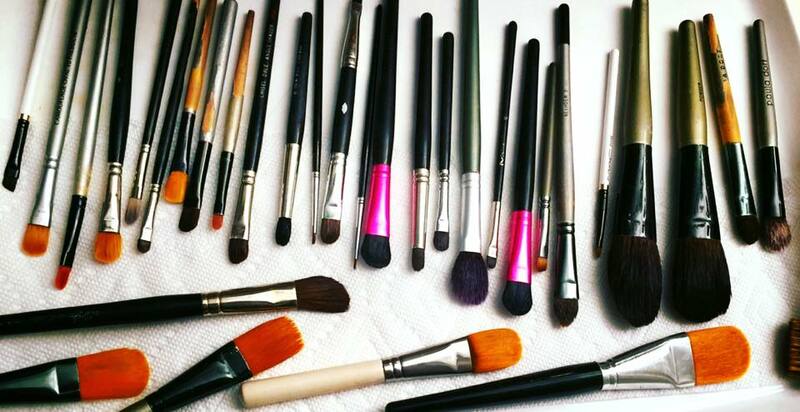 For private makeup brush use: Repeat brush washing instructions every week. How Nicole Bryl Gives Back: Her Colombia Project featured on actress Sofia Vargas's website.